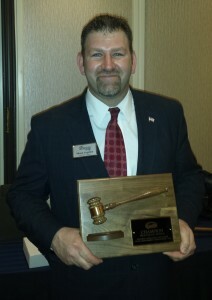 Shaun Logsdon won the 2014 Kentucky State Champion Auctioneer title after competing against some of the finest auctioneers across the state at the Kentucky Auctioneers Association’s 57th Annual Convention. This event themed ”Selling Across the Bluegrass” experienced record breaking attendance and was held February 7th through 9th at the Downtown Hilton in Lexington, KY. Contestants were judged based on voice, rhythm, clarity, microphone control, stage presence, speed and knowledge of their products being sold. The contest consisted of a preliminary round where the top 5 participants advanced to the finals. During the finals each contestant was required to answer a question related to the auction industry in which each were judged on their response. Spectators had the opportunity to bid and purchase items as part of the contest, with the proceeds going to St. Jude’s Children Hospital. “I am extremely honored to receive this award and look forward to representing the state of Kentucky at the International Auctioneer Championship which just happens to take place in Louisville this year. This is an experience I will never forget and I extremely humbled when thinking of the long list of amazing auctioneers that have won this prestigious award,” Logsdon stated. The International Auctioneer Championship is hosted by the National Auctioneers Association (NAA) at the International Auctioneers Conference and Show will mark the 65th year for this event and it is being held in Louisville, Kentucky at the historic Galt House Hotel. Logsdon was instrumental in the NAA’s decision to bring their convention to Louisville by working closely with the Louisville Convention and Visitor’s Bureau. As a result the Louisville Convention and Visitor’s Bureau recently awarded Logsdon the Ambassador Award at the 2013 Rose Awards for his contribution to the city’s presentation to the NAA. Shaun Logsdon, of The Logsdon Group and Premier Benefit Auctions based in Louisville, KY is a Professional Auctioneer and Real Estate Broker with more than 12 years experience conducting real estate, personal property, automobile and charity auctions. As a strong advocate of Louisville Shaun is looking forward to sharing his city with fellow Auctioneers from all over the United States.